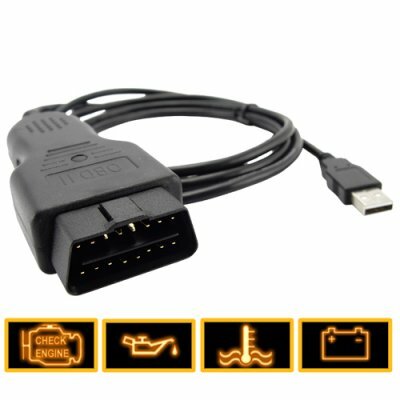 Successfully Added USB VAG Commander 5.1 OBDII Diagnostic Cable (VW and Audi) to your Shopping Cart. Getting started with this diagnostic cable is easy. All you need is this VAG cable, a computer, and a vehicle. No extra converters, connectors, or tools are required. Plug one end of the cable into your vehicle's Diagnostic Link Connector (DLC), which is usually located within easy reach of the driver. Plug the other end into your computer's USB port, and install your favorite diagnostic software. You're now ready to access and interact with your car's on-board computer. Do-it-yourself has never been so simple! Professionals, do-it-yourself mechanics, and anyone concerned with the safety of their vehicle will love this product. Take advantage of our unbeatable low price to try one out today. Then order in bulk to enjoy even greater savings and beat your competitors on eBay! From your best source of high-tech, low price gadgets, Chinavasion. NOTE 2: The CVSN-A95 VAG Commander 5.1 cable works on vehicles that's are OBDII/CANBUS compliant as listed above. If you are not sure if this cable type will work with your car model, then check the car user manual, contact your car dealer or talk to your favorite mechanic.